Gain energy, boost your mood, and get healthy with fun activities you can do with your kids as a family like practicing sports skills and dancing. There aren’t enough hours in the day to complete every task mothers need to do. The kids, husband, housework, career, and other obligations take up so much time that many mothers neglect themselves. One area they often cut out of their routine is exercise. Many moms report that they don’t have the 150 to 300 minutes a week for exercise, as recommended by the Centers for Disease Control and Prevention. But by putting themselves last, they not only hurt their mental and physical health but the rest of the family, as well. Exercise is usually viewed as a way to control weight, which it does, but it also reduces the risk of heart issues, diabetes, and other diseases and illnesses. Furthermore, exercise improves mood and increases energy, which are two things moms always need more of. 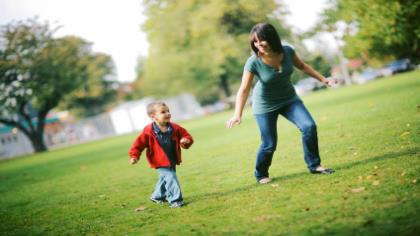 Here are seven fun ways moms can incorporate more activity into their lives. A baby can ride in a carrier on your person, which will increase calorie burn. Or, put the baby in a stroller. If your children are older, they can walk along side you. Try to walk at a brisk pace to get your heart rate up and improve endurance. If your children don’t ride bikes, attach a child seat to the front or back of your bike, or get a bike trailer for them to sit in. Make sure the bikes are in good working order and that you and your children wear helmets. Today, children spend way too much time in front of screens, which is hurting their health. Show them how fun it is to play outside by joining them in a game of tag or hide-and-seek. The Wii, Xbox and other gaming consoles offer games that require full body movement, such as dancing and simulated sports. An advantage of active gaming is that since it’s fun, it doesn’t feel like exercise. Make sure that you have plenty of room and that you’re using the gaming equipment properly to avoid injury. Put on your favorite music with a beat and get dancing. Like active video gaming, you can dance for a long time and not feel like you’re working out. TV commercials offer about 2 minutes to get up and get active. Make it fun by having a push-up or jumping jack contest. If your child is in recreational sports, dance class or other activity, take time to practice at home. Do drills, and practice the skills related to the activity. Having your child teach you the sport will solidify his knowledge of the activity, as well as boost self-esteem. Exercise is crucial to your health and is a great way to increase your energy and mood. It will model a lifetime of healthy behavior for your children, and by exercising as a family you build relationships and have fun.